Much feminist scholarship has viewed Catholicism and Shi'i Islam as two religious traditions that, historically, have greeted feminist claims with skepticism or outright hostility. Creative Conformity demonstrates how certain liberal secular assumptions about these religious traditions are only partly correct and, more importantly, misleading. 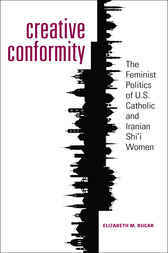 In this highly original study, Elizabeth Bucar compares the feminist politics of eleven U.S. Catholic and Iranian Shi'i women and explores how these women contest and affirm clerical mandates in order to expand their roles within their religious communities and national politics. Using scriptural analysis and personal interviews, Creative Conformity demonstrates how women contribute to the production of ethical knowledge within both religious communities in order to expand what counts as feminist action, and to explain how religious authority creates an unintended diversity of moral belief and action. Bucar finds that the practices of Catholic and Shi'a women are not only determined by but also contribute to the ethical and political landscape in their respective religious communities. She challenges the orthodoxies of liberal feminist politics and, ultimately, strengthens feminism as a scholarly endeavor.